Melbourne Snake handler, Victoria, Australia, Official Site. 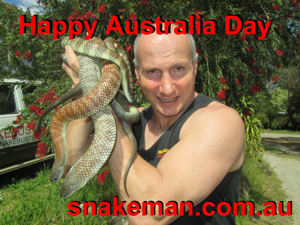 Snake catcher, Snake removals, handler shows, children's parties Melbourne! Beware of inexperienced imitators marketing themselves as "Snake Handlers" who attack snakes with tongs. Reptile expert, Ray Hoser and his trained staff won’t attack snakes with illegal “killer tongs”. 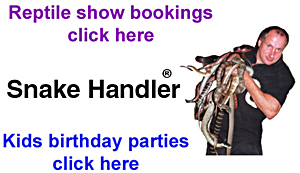 In Australia, only the snake man, Raymond Hoser owns a registered trademark for the words "snake handler" (with logo on this page), trademark number 1436530. Beware of inexerienced imitators, masquerading as "official" snake handlers and their SEO websites. They use tongs to attack snakes and are imposters! 8 Bell Street, Hawthorn, Melbourne, Victoria, 3122, Australia.